Much of the work involved in wildlife rehabilitation isn’t interesting or glamorous. Actually, a lot of it is downright gross. I learned that fact my first week as a volunteer at AWARE wildlife center when my trainer asked me to cut up a dead rat for an injured vulture, testing my mettle for dirty work from day one. Cleaning soiled enclosures, washing dirty dishes, processing filthy laundry, and other unseemly tasks make up most of the work — essential, but hardly pleasant. Feeding baby animals is gratifying, but it, too, can feel like work when trying to keep up with the demands of numerous animals requiring multiple feedings a day. But rehabilitation has numerous rewards, too. One of the greatest rewards is watching an animal return to the wild, especially when you have been closely involved in its care. I’ve had the privilege of releasing several animals back to the wild, including opossums, raccoons, turtles, geese, songbirds, and hawks, as well as squirrels I have raised (see my post Nutty for Squirrels). Each of these releases was memorable, but perhaps none more so than the long-awaited release of three young coyotes last week at dusk. 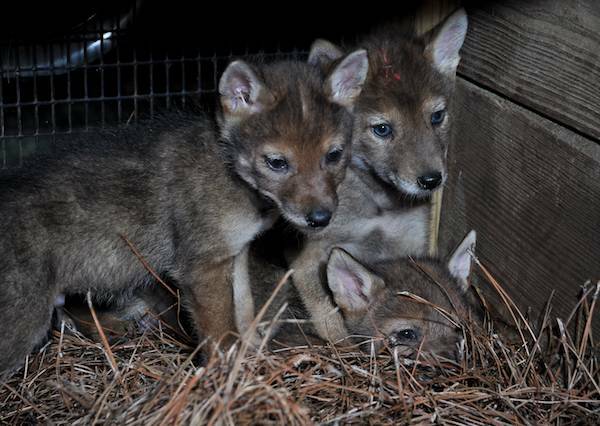 The three orphaned male coyote pups from two different litters were brought to AWARE last spring after their parents had been trapped and killed, a far too frequent occurrence. Understandably, some trappers have a harder time killing defenseless pups, so they occasionally end up in our care (such scruples from people who have been paid to kill the adults, but leave the orphans to be raised at AWARE’s expense!). Because I have been vaccinated against rabies as a precautionary measure, I was one of a few volunteers who regularly fed and cleaned up after the three pups. Every Tuesday for seven months, I delivered their food and cleaned their enclosure (which became increasingly foul as they grew older! ), so I witnessed their growth up-close. Within a few weeks, the pups’ instinctive wariness of people overrode their curiosity. Even though I’d never done anything more than clap, they were terrified each time I approached to feed and clean, hiding or pacing frantically at the far end of their enclosure. My heart broke to see them, but I knew this fear was necessary. 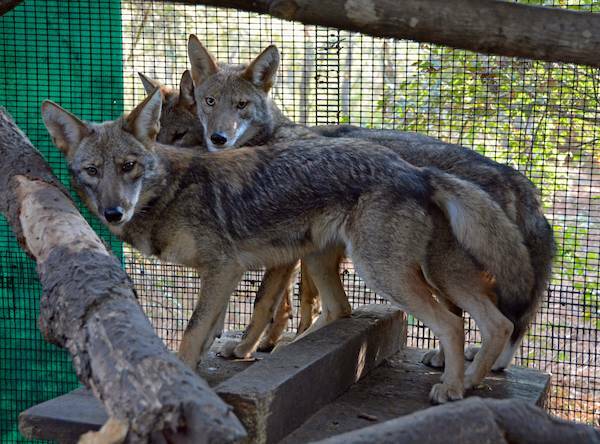 As the coyotes grew, seeing them living a caged life became increasingly difficult. Although AWARE’s enclosures give the animals plenty of room to climb and move around, coyotes need to run free. Until they were full-grown and able to find food, catch prey, and defend themselves, however, releasing them would have been a death sentence. Still, even though they are now full-grown, these youngsters have been forced to strike out on their own at a much younger age than their parents would have required in the wild. 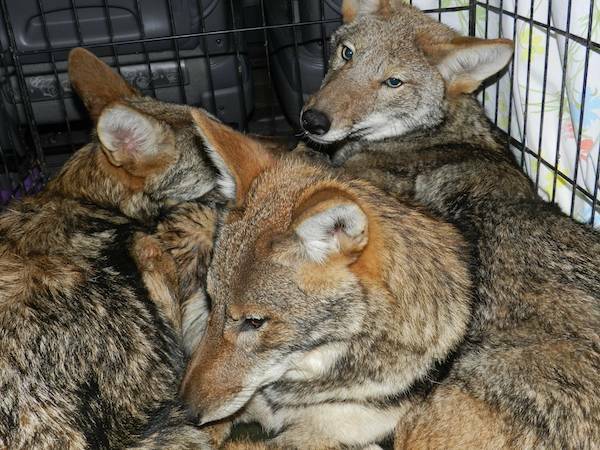 When release day arrived, I helped corral the coyotes into a kennel, wrestling one frightened kid out from a corner, and then loaded them into the back of my minivan. 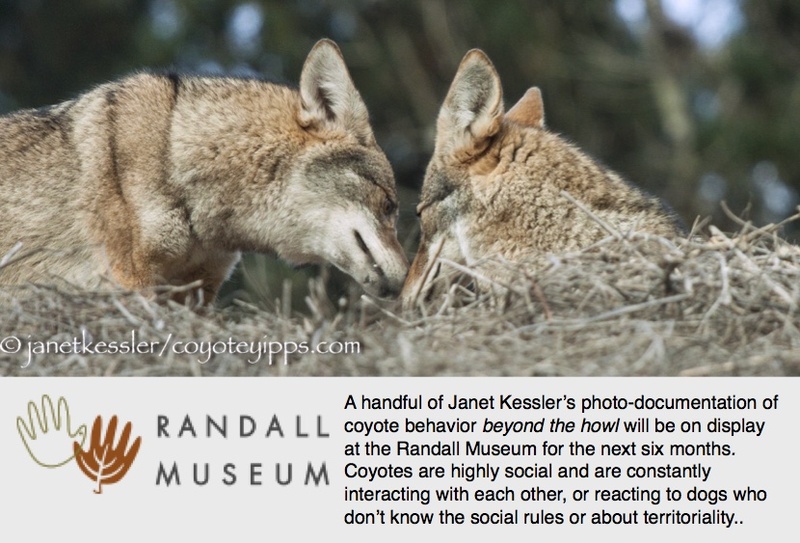 (Never thought I’d count coyote wrangling among my skills!) My good friend and fellow volunteer Kelly joined me on a two hour ride to north Georgia where we had permission to release the small family on private land safe from hunters, cities, and busy roads. Ready for release — Good Luck boys! When we arrived, we parked near a wooded area and waited a short time for dusk to fall in order to give the coyotes the best chance to explore their surroundings without danger from humans. When the moment seemed right, we lowered the kennel to the ground and opened the door. The coyotes crowded to the back of the cage. Everything must have seemed so strange to them! After a few minutes, I stepped up to the cage and gave it a gentle shake. One coyote dashed out like a shot and was out of sight in the blink of an eye. Twice more I had to shake the cage before the remaining two coyotes were compelled to leave, but once they stepped out, their legs carried them full speed ahead until the fading light obscured them from our view. How fascinating to imagine all the new experiences and adventures they had on that first night of freedom! Did they seek each other out with yips and howls as night fell, or did they venture off in their own directions? What animal did they catch for their first meal? We’ll never know their fate, but we equipped them for the wild the best we could by helping them learn to recognize food sources, catch prey, and avoid humans. We wish them long, healthy lives. Note: Like a lot of wildlife, coyotes (and foxes) generally aren’t welcome near human development, where they are frequently trapped and destroyed. Relocating these animals (without rehabilitation permits) is against the law in Georgia, and in most states, I suspect. In addition, in many states they can be hunted without restriction at any time of year, and the federal government contributes to the slaughter of tens of thousands of coyotes each year. To learn more about AWARE or to make a tax-deductible donation to help wildlife, visithttp://www.awareone.org.